Here’s a another delicious way to eat your greens – Simple Spiced Spinach Soup. This soup happened a bit by chance. It was an easy weekend awhile back when we decided we were in the mood for something light like salad. Hubby offered to make a quick trip to the grocery store to get the ingredients. But, when I saw what he came back with, I realized salad probably wasn’t going to work. In the bags: one bunch of spinach (not baby), celery, and carrots. These weren’t salad ingredients. They were more…soup ingredients! So, I decided to create a simple soup, starting with a basic mirepoix (my usual soup starting point) thanks to some frozen chopped onions. 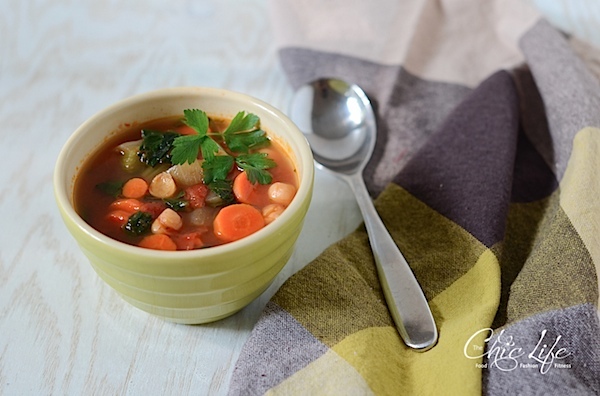 I added fire roasted tomatoes for a deep, almost smoky flavor, plus chickpeas for substance. Chili powder added to the spiced flavor of the soup, and the spinach wilted beautifully into the broth to add extra vegetables to each serving. Healthy, simple ingredients, easy to make. What’s not to like? This soup would make a delicious, light dinner or lunch, perfect with hearty toasted whole grain bread. Just a couple pantry spices add a tasty, spiced flavor. Freeze the leftovers for a “fast food” option without having to leave your house. Pre-heat a medium-large pot over medium heat. Add olive oil, onion, celery, and carrots. Sprinkle with salt and pepper. Cook, stirring occasionally until the onions become translucent, about 5 minutes. 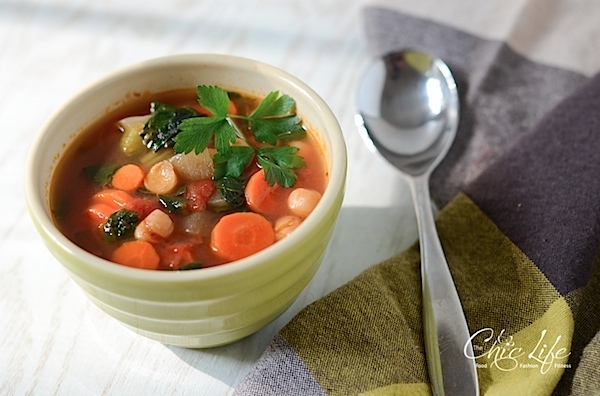 Stir in vegetable broth, chickpeas, tomatoes, chili powder, and paprika. Bring to a boil. Add spinach and cook until the spinach is wilted and to the texture you like, about 5-10 minutes (just taste test the spinach till you like the texture). Serve with hearty whole grain toast. Garnish with fresh parsley. Did you like this post? Be sure to share it with your friends on Facebook and Pinterest. Clicking the share buttons below let me know what you like so I know what to do more here on The Chic Life! You can also follow me on Facebook, twitter, and Instagram for more content! Yes! Recipes that are healthy & good even my oh so picky husband will like. Thanks so much for sharing. Yum, this looks perfect for these chilly Fall nights! 🙂 Thanks for sharing! Cheers. In one of your posts you mentioned something about starting a website for local and small restaurants. I think it is a great idea and I wish if you can include small and local producers. You start with your area, then expand to the rest of the states and even the rest of the world. Bloggers and readers can add their local and small producers, farmers, bakers, cheese makers, etc. And it would be better if the produce are seasonal, local and organic. I’m so passionate about eating seasonal, local and organic produce and since I moved to this part of Italy in the mountains, I buy the veggies and fruit I do not grow from local farmers and producers; cheese from a local cheese maker who became a friend of mine, etc. I haven’t stepped inside a supermarket in months and plan to never go there. I wish I could shop like you! That sounds lovely!